"The Six Million Dollar Man" and "The Bionic Woman"
It is unlikely the average person will remember the name Martin E. Brooks. If they hear he played Dr. Rudy Wells, most people still may not remember. Then comes the description that anyone who grew up in the 1980s will remember: He made the bionic man bionic. Awhile back, Martin E. Brooks was in the news because, at the age of 90, he passed away. Still, he leaves a unique mark in television history for a role he played on not one, but two shows on two different networks, a rarity in both cases indeed. Martin E. Brooks started his acting career on stage and screen in 1951, proceeding to guest star in a variety of television shows over the next 25 or so years including a recurring role in “McMillan & Wife” in 1972-1973. Soon, he would find the role that would etch his place in television history. When Oscar Goldman said, “Gentlemen, we can rebuild him, we have the technology,” Dr. Rudy Wells was the man who could actually do that. Goldman ran an organization called the OSI which stood for a number of things over time, including the Office of Scientific Information and the Office of Scientific Intelligence. 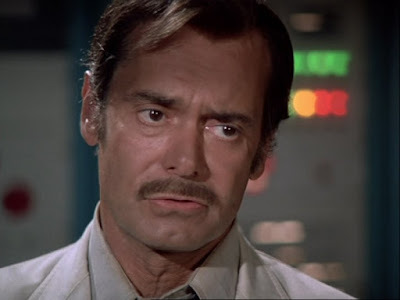 When astronaut Steve Austin, played by Lee Majors, crashes a plane leaving him barely alive, Goldman, played by Richard Anderson, suggests the OSI rebuild him using the theories on bionics of Dr. Wells. Initially, Martin Balsam played Wells in the pilot, then Alan Oppenheimer occasionally through the first two seasons of "The Six Million Dollar Man". Martin E. Brooks assumed the role in 1975 and would portray it for the next 20 years. He debuted in the third-season episode, “The Return of the Bionic Woman” which was a springboard to the popular spin-off of the same name starring Lindsay Wagner. It actually took me a little getting used to. Brooks looked quite a bit younger than Oppenheimer, and I got used to Oppenheimer playing Rudy Wells. I had not seen Martin Balsam play that role, and would not until I got "The Six Million Dollar Man" on DVD and saw him there a couple years ago. Still, I did get used to Brooks in the role. Over time he became a recurring character, and occasionally the centre of an episode. One in particular, entitled, “The Most Dangerous Enemy” turned the show on its head. Rudy is bitten by a crazed monkey, who has been the subject of scientific experiments, and develops super-human strength, leaving Steve Austin as the only person who can stop him. Once “The Bionic Woman” spun off in January of 1976, Martin E. Brooks played the same recurring role there. “The Bionic Woman” aired on ABC initially, for two seasons, from the middle of the 1975-1976 season to the 1976-1977 season when it was cancelled. NBC then picked up “The Bionic Woman” for the 1977-1978 season where it aired for one more season. Meanwhile, ABC continued airing “The Six Million Dollar Man” for the 1977-1978 season. Both shows were cancelled in 1978. However, it was the first time two actors, Brooks and Anderson, played the same character on two different shows airing on different networks. There would be three reunion movies: “The Return of the Six Million Dollar Man and the Bionic Woman” in 1987; “Bionic Showdown: The Return of the Six Million Dollar Man and the Bionic Woman” in 1989; and the one that wrapped up everything in 1994, called alternately “Bionic Ever After?” and “Bionic Breakdown”. That would be the last we saw of Martin E. Brooks as Dr. Rudy Wells. Martin E. Brooks would go on to have further guest roles in the 1980s in everything from “Quincy”; “Dallas”; and “Trapper John, M.D.” to “Airwolf”; “Cagney and Lacey”; “Benson” and “Hunter”. There would be a few roles in the 1990s, including a stint on “Knot’s Landing” but that would be pretty much it. Still, a 45-year career was incredible. Re-runs of "The Six Million Dollar man" and "The Bionic Woman" aired after school throughout the first part of the 1980s on Channel 13 on my peasant vision dial. I will always remember Martin E. Brooks as the scientist who made Steve Austin and Jaime Sommers bionic. In the end, in fact, he did rebuild them, and wrote his name in pop culture history.